Figure 1. Opioid Pain Reliever Sales, Related Treatment Admissions, and Related Deaths from 1999-2010 (CDC). Over the past two decades, rates of opioid prescribing in the United States have skyrocketed, with the total amount of opioids distributed quadrupling from 1999 to 2010 (see Fig. 1). Rates of opioid related unintentional overdoses and deaths have risen in concurrent fashion, from 4,030 in 1999 to 14,800 in 2008. Public health experts, policy makers, and physicians have slowly come around to acknowledging the epidemic of opioid abuse now facing the country. Indeed, nearly 4 in 5 heroin users reported prior exposure to non-medical prescription pain relievers, and prior exposure to narcotic pain medications carried a 19-fold increased risk of future heroin use. A study from 2014 estimated that as many as 13.8% of patients discharged from ED's across the country in 2010 were written a prescription for opioid pain medications, up from 11% in 2005. Still, a large amount of uncertainty persists about the true impact of prescribing habits of Emergency Physicians (EP's) on the incidence of narcotic abuse. This study helps shed some light on how EP prescribing practices impact long-term narcotic use. Barnett ML, Olenski AR, Jena AB. Opioid-Prescribing Patterns of Emergency Physicians and Risk of Long-Term Use. N Engl J Med. Feb 16 2017. 376(7): 663-673. Medicare Beneficiaries who visited any ED in the US from Jan 1, 2008 – Dec 31, 2011 who had not received an opioid prescription in the preceding 6 months and who were not admitted to the hospital on the index ED visit studied. Patients with cancer or on hospice were also excluded. Using Medicare Part D data, the authors calculated the morphine equivalents dispensed both in the 7 days following the index ED visit and any further opioid prescriptions over the following 12 months. Treating EPs were categorized as either high-intensity or low-intensity opioid prescribers based on comparison with their peers at the same hospital. The authors calculated the percentage of patients that filled an opioid prescription after seeing any provider in a given hospital, and then divided providers into quartiles of rates of opioid prescribing within their own hospital. Physicians in the top quartile were designated high-intensity prescribers; those in the bottom quartile were designated low-intensity prescribers. The primary outcome of interest was rate of long-term opioid use among patients in the 12 months following a visit in which they were seen by either a low-intensity or high-intensity opioid prescriber. Long-term use was defined as at least 180 days of opioids supplied in the 12 months after the initial ED visit, excluding the first 30 days following the ED visit. 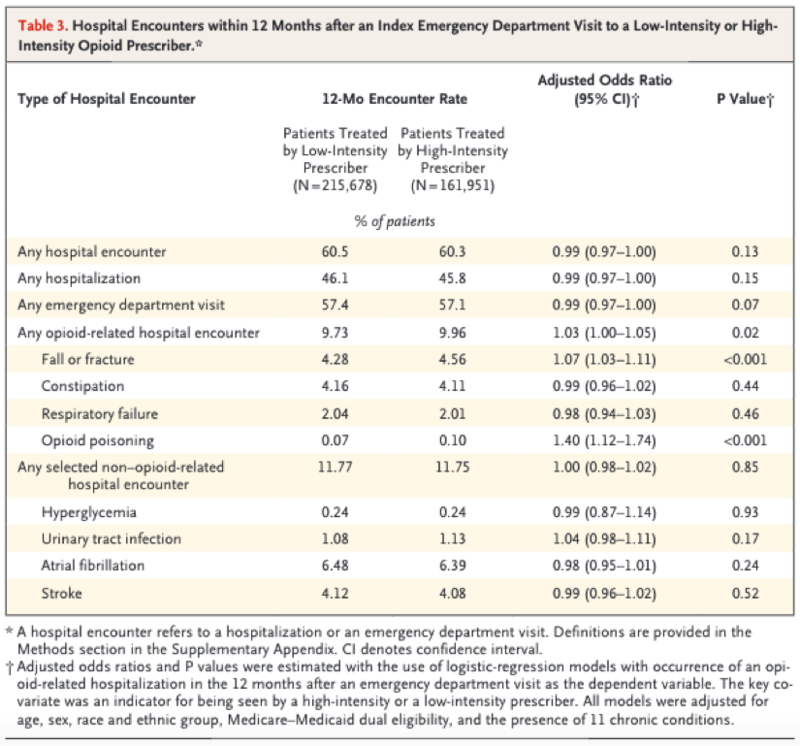 Secondary measures included rate of hospital encounters possibly related to the adverse effects of opioids in the 12 months following the index ED visit. The authors also measured repeat ED visits at 14 and 30 days for the same primary diagnosis to assess for possible undertreated pain. Long-term opioid use was significantly higher among those treated by high-intensity prescribers, with an odds ratio of 1.3 (p<0.001) and an absolute rate of 1.51% as compared to 1.16% in the low-intensity group. The authors calculate a number needed to harm of 48 patients receiving an opioid prescription to lead to one excess long-term opioid user. Long-term opioid use increased in a stepwise fashion for patients treated by physicians in each quartile of prescribing intensity (Fig 1). A total of 377,629 patients were included in this retrospective analysis; 215,678 were seen by low-intensity EPs and 161,951 were seen by high-intensity EPs. Characteristics of each patient population were similar, though several of these were significant given the large sample size (see Table 1). Over three times as many patients seen by a high-intensity prescriber were discharged with an opioid prescription than those seen by a low-intensity prescriber (24.1% vs. 7.3%), though there was no difference between the two groups in the median dose of morphine equivalents per prescription. In the secondary analysis, the authors found a small but significant increase in rates of opioid-related encounters (OR 1.03, p = 0.02) as well as ED visits for fall or fracture (OR 1.07, p < 0.001) for patients treated by high-intensity prescribers. In contrast, there was no difference in rates of hospital encounters for non-opioid related complaints. Additionally, rates of short-term ED visits for the same chief complaint were no different at 14 or 30 days for patients treated by either low- or high-intensity prescribers (See Table 3). This study does an impressive job of looking at an important but poorly understood issue in the field of emergency medicine – how do prescribing practices of physicians affect long-term opioid abuse their patients? This retrospective study design is limited in that it was not randomized-controlled, but it was the most logical design to answer the question at hand. The number of patients included was certainly adequate to detect a meaningful difference. The study was limited by the fact that only Medicare beneficiaries were studied, in part because this was the most accessible database for such a large retrospective study. However, it therefore excludes many in the 19-39 age range in which long-term abuse potential is highest. Designing a randomized-controlled trial to attempt to answer this question would be difficult as it would require standardization of discharge prescriptions; few physicians would be amenable to ceding their right to determine the analgesic plan for their own patients. The primary outcome of interest – long-term opioid use among patients seen by either type of provider – demonstrated that there is a correlation between high-intensity prescribers and long-term opioid use among patients they see. The authors calculate a number needed to harm (NNH) of 48 among patients prescribed opioids on discharge. This means that for every 48 patients given a discharge prescription for an opioid analgesic by a high-intensity prescriber, one will go on to use opioids long-term (as defined by this study) that could have been avoided if the patient had been seen by a low-intensity prescriber. One of the most interesting results from this study is not even the question the authors set out to answer, but is the difference in opioid prescribing rates between high-intensity and low-intensity prescribers. This difference was over three-fold (7.3% to 24.1%) and represents an extraordinarily wide practice variability that underscores the lack of standard practice for opioid use. However, this variation was only in the number of prescriptions written and not for the amount of morphine equivalents per prescription as demonstrated in Fig. S3 above. The counter-measure of pain control adequacy is an important one. The authors attempt to address whether patients treated by low-intensity providers had inadequate analgesia at home. While this question was not directly answered by the study, a surrogate measure of return visits to the ED with the same chief complaint demonstrated no significant difference between the two groups, which suggests but does not prove that there was no meaningful difference in analgesia between the groups. Is this article practice changing? Perhaps. It does provide evidence that there is a correlation, small though it may be, between prescribing practices of EPs and long-term opioid use of patients. There are also small but significant differences in complications from the opioids given by high-intensity prescribers. The study further highlights the profound variability among EPs regarding their opioid prescribing practice, which I argue is an area to target for improvement especially without any known deficiency of pain treatment by doing so. We can all strive to only prescribe opioids that are truly necessary to treat acute pain, and this article serves as further motivation that over-prescribing can in fact cause our patients direct harm. This is a great overview of an impactful article. While ultimately there will always be some variation in opioid prescribing (by chance, some physicians will likely see more patients with more painful conditions), this paper suggests that the prescriber variability is high and its not due to chance. Regardless, my takeaway here is that there does seem to be a dose-response to opioid prescribing in the ED and longer term opioid use. Both the sheer scale and physicians’ role in the opioid epidemic is startling and a number of factors are at play. Years of focus on oligo-analgesia were likely a mix of genuine concern for undertreating pain but unfortunately also driven by those with specific financial interests. Similarly, the increasing focus on patient satisfaction/experience and even with the link to payments, I suspect physicians are too quick to shift blame to others and we need to prescribe more responsibly. While most emergency department opioid prescriptions are short (75% are for 20 pills or fewer ), as Barnett and others have shown, a startling fraction of ED patients receive opioid prescriptions. And to borrow from Lewis Nelson, everyone who is addicted to opioids had to have had a first exposure. Set realistic goals: I don’t have a silver bullet to make pain go away. My goal is to make their pain manageable, not gone. Emphasize our priorities: Our main goal in the ED is to make sure there isn’t anything dangerous causing the patient’s symptoms. Information, information, information: what concerning symptoms to look for at home, when to call your doctor, when to come back to the ED. Incidentally I rarely prescribe or co-prescribe benzodiazepines as we have some data they aren’t very helpful (e.g. Friedman ) and that we vastly underestimate their harms, particularly when patients take both opioids and benzos (e.g. Sun ). We have a tight needle to thread between oligoanalgesia and the opioid epidemic, but right now I think it’s clear that the pendulum has swung too far. I don’t think we can nor should stop using opioids altogether (yet) but we can be thoughtful and careful as we care for our patients. [Peer-Reviewed, Web Publication] Andereck J, Haney R (2018, Jan 29). Journal Club: Do Emergency Physician Opioid Prescribing Practices Impact Long-Term Opioid Use? [NUEM Blog. Expert Commentary By Trueger S]. Retrieved from http://www.nuemblog.com/blog/opioids. “Vital Signs: Overdoses of Prescription Opioid Pain Relievers --- United States, 1999-2008.” Morbidity and Mortality Weekly Report. Centers for Disease Control and Prevention. Nov 4, 2011. 60(43): 1487-1492. < https://www.cdc.gov/mmwr/preview/mmwrhtml/mm6043a4.htm#fig2>. Cantrill SV, Brown MD et al. Clinical Policy: Critical Issues in the Prescribing of Opioids for Adult Patients in the Emergency Department. From the American College of Emergency Physicians Opioid Guideline Writing Panel. Ann Emerg Med. 2012. 60:499-525. Muhuri PK, Gfroerer JC, and Davies MC. Associations of Nonmedical Pain Reliever Use and Initiation of Heroin Use in the United States. Center For Behavioral Health Statistics and Quality. CBHSQ Data Review. August 2013. Hoppe JA, Nelson LS, Perrone J, Weiner SG. Opioid Prescribing in a Cross Section of US Emergency Departments. Ann Emerg Med. 2015 Sep;66(3):253-259. Friedman BW, Irizarry E, Solorzano C, Khankel N, Zapata J, Zias E, Gallagher EJ. Diazepam Is No Better Than Placebo When Added to Naproxen for Acute Low Back Pain. Ann Emerg Med. 2017 Aug;70(2):169-176. Sun EC, Dixit A, Humphreys K, Darnall BD, Baker LC, Mackey S. Association between concurrent use of prescription opioids and benzodiazepines and overdose: retrospective analysis. BMJ. 2017 Mar 14;356:j760. doi: 10.1136/bmj.j760. Posted on January 29, 2018 by NUEM Blog and filed under Pharmacology and tagged opioids addiction prescribing practices narcotics pain control prescriber variability.